Cristina Iacob is a yoga travel adventurer with a passion for health and writing. She is a therapeutic yoga teacher accredited by IATY and a holistic nutritionist certified in the US. Some people decide to change their treadmill’s walking board once a year, just because it’s part of their extended warranty. But what do you do if you didn’t purchase an extended warranty and your walking board needs replacing due to a deformity, crack or other damage? If you consider yourself a handy person -- with a few materials, some courage and a lot of will, you can make a walking board for a treadmill all by yourself. The only exception is if your deck is made of metal; then, unless you’re a pro when it comes to cutting metal, you should contact your treadmill manufacturer and purchase a deck. Buy a piece of 1/2-inch, AC-grade plywood that is slightly bigger than your treadmill walking board. Remove the motor cover by using a Phillips screwdriver on the screws that attach the cover to the treadmill body. Reduce the belt tension either by turning the belt tension adjustment bolts counterclockwise or using the belt-tension adjustment knob, if your machine has one. Remove one of the side plates by taking out the screws that keep it in place with a Philips screwdriver and sliding it off. Pull off the drive belt from the front-roller pulley by putting your screwdriver between the pulley and the belt and rotating the front roller while forcing the belt off the pulley. Remove the brackets holding the front roller and slide off the front roller from out of the walking belt. Slide the running belt off the back roller. Remove the walking board by taking off the bolts which keep the wood board in place, using an Allen screwdriver. Put the new sheet of plywood on the ground and set the old walking board on top of it. Take its measurements and mark the location of the holes for the bolts by marking the plywood with a marker. Cut the plywood with a circular saw and use a drill to make 3/16-inch holes for the bolts. Then, use a sanding block to smooth out the plywood’s "A" face and edges. Cover the A-grade side with three coats of clear wood sealer, one coat at a time, giving each coat enough time to dry off before applying the next one. Use fine-steel wool to buff the surface and then clean it and apply a smooth layer of lube on the top side of the board. Position the finished walking board on the treadmill and fix it in place with the bolts. Put the belt on the rollers and the front roller back in place. Attach the side plate and the motor cover to the treadmill using the Phillips screwdriver. Adjust the tension belt and plug the treadmill back into the wall socket. Dry lube spray is easy and fast to apply to the new walking board before installing it into the treadmill. Make sure the lube is the right kind by checking the treadmill's manufacturer's specifications. 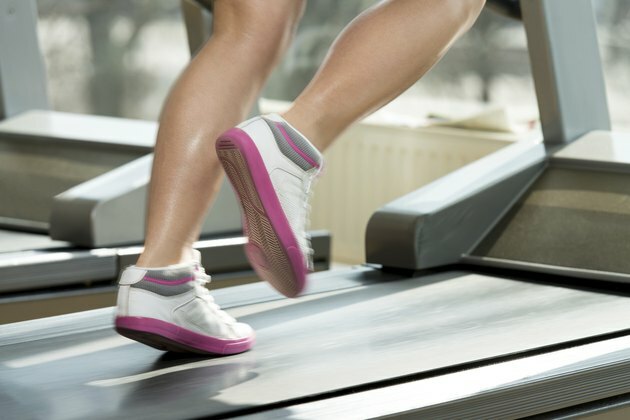 Without getting on the treadmill, run the treadmill for a couple of minutes at the speeds you usually use and check that the belt stays put and doesn't move to the side.